Oh no! This event has passed. Check out our upcoming events here. 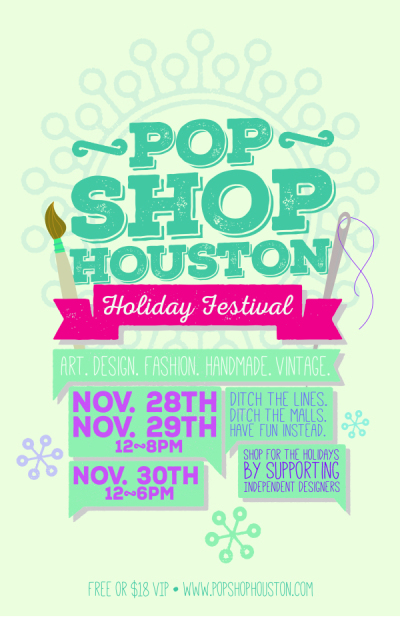 RSVP to Pop Shop Houston Holiday Festival Black Friday-Sunday on FB Here. It’s the event of the season. Starring Traci lavois with Poems for Barter, Sale, or Trade, Music by the Reverberation DJ’s and Here Come the Girls. VIP Lounge featuring TASTINGS from Topo Chico, Greenhouse Catering Co., Whole Foods, Kind Bar, Bravado Spice, Salinas Salsa, Co., Gray Gardens Granola, Paleo Sweets by Love Bites by Tanuja, Sugar & Spice Bakery and more. VIP is $18 and can be purchased here. 3 lucky VIP’s will win a year membership to Memorial Park courtesy of Memorial Park Conservancy. Live Performances by Chase Hamblin and Trio Musette with the Reverberation DJ’s and Here Come the Girls. Fashion Shows by Yoko Vintage, Tropicouture, Shina Rae, Forgotten Arts Clothing, and Danny Nguyen. See Pop Shop Houston’s featured artists here.